One of my favorite Disney DVDs. 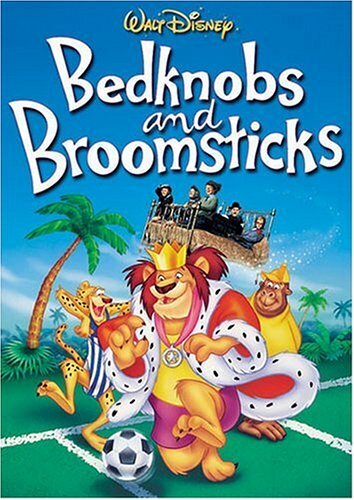 In 1971, Bedknobs and Broomsticks, a film many call a Mary Poppins rip-off, premiered at Radio City Music Hall, but in a version in which nearly half an hour of footage, including full songs, was removed. For its 25th Anniversary in 1996, Disney re-inserted all of the deleted footage except for one musical number in which the picture was lost. The Academy Of Motion Picture Arts And Sciences screened this in 1996, but it didn't get a theatrical release, and for years, the only way Americans could get it was either by the 1997 laserdisc release, an import of a European video, or by catching it on occasion on the Disney Channel. Finally, in 2001, for the film's 30th Anniversary, Disney released a DVD with this extended version of the film. Restored and remastered, the film now has a clearer plot, extended musical numbers, and songs previously deleted. The brilliant "Portobello Road" number is now restored to its original running time, as well as Miss Price's response verses, titled "Don't Let Me Down" during Mr. Browne's song "Eglantine," and the previously entirely deleted songs "With A Flair" and "Nobody's Problems" are restored to the film. The DVD is a mixed bag. The transfer is quite nice, but Lowry Digital, who did the recent Mary Poppins, Bambi, and Cinderella DVD restorations, could punch it up a little, as on occasion, I saw a bit of grain, and the occasional film artifact, especially during the closing credits and Walt Disney Pictures logo. However, this film has still never looked better on home video, so it's fine with me. The extras could have been better. An actual making-of on the film would have been nice, including footage used in the Music Magic featurette. While that featurette does give some nice insight on the restoration, there's nothing behind-the-scenes about it except for the creation of the music score. Nothing about the effects, actors, nothing. But it's worth a look for info on the film's 1996 restoration. A larger gallery would have been nice. I do like the inclusion of the two cartoons. And of course, I'm happy to see that they have included theatrical trailers. The best supplement, however, is the deleted song A Step In The Right Direction. That song was the catalyst that jump started this restoration project to begin with, so there's a bit of irony here in the fact that they couldn't find the footage of the song. So the supplement on the DVD, which is ported over from the 1997 laserdisc and was shown after the movie when the Disney Channel aired the restored version, is reconstructed using still photos of the scene and the original soundtrack. Hopefully one day, the footage will be found and they will be able to reinstate the number into the film, or at least they'll decide to include the photo reconstruction a la the restored version of A Star Is Born with Judy Garland. Some have complained that there isn't an option to watch the original, shorter version due to its length and/or the poor dubbing of the voices in deleted scenes. (For much of the non-musical deleted footage, original dialogue soundtracks could not be found, so many of the deleted scenes had to be re-dubbed.) While I prefer the restored version despite the dubbing flaws, I think it would be wise of Disney to release both versions on DVD. Next year is the 35th Anniversary - maybe Disney will make a 2-disc DVD featuring both editions, with bonuses spread out on each disc, to appease all fans. Or better yet, a 3-Disc Collector's Edition, with discs 1 and 2 containing both cuts of the film and disc 3 with all the supplements. While neither edition is likely, the 2-Disc is a more likely option. I loved this movie as a child and my 2 year old loves it too. The animation in the middle of the movie makes it a great surprise for kids. This is one of my all time favorite movies. Some of my favorite parts include the one in the cartooned section of the kids under the sea. I also like the battle at the end with all the knights. Forming a plan to fight the invading German troops during the war, Mrs. Price decides to embark on using her witch talents to succumb the army. Unfortunitely for her, she gets interrupted by becoming caretaker and provider for 3 children assigned to her home. As children so often do, they quickly discover her hidden talents, and intentions. And as children so often do, they decide to join her magical efforts. But she requires additional words to complete a working spell, and that leads all four of them to London on a magical riding bed, to seek the professor of her correspondence of witchcraft. My Daughter is Addicted to this movie. I remember loving this movie when I was a kid, but I just watched it with my four year old, and I was a little disappointed. It is not nearly to the caliber of Mary Poppins, to which it is often compared. The humor and setting are a lot darker, set as it is during World War II, and there is an under-current of anti-clericalism and of mass violence that is unsettling for a children's film. Others may find the animated sequence to be a high note. I thought it was long and tedious. What was better than remembered was the Portobello Road dance sequence, which I thought was truly ahead of its time. There is break-dancing, and even the beginnings of a moon walk dance move. It wouldn't surprise me if this is where Michael Jackson picked up the idea for his Billy Jean dance moves. I would definitely not recommend this for 4 year old girls. I think it skews a little older and is probably more appealing for boys than girls. To begin with, you can think of Bedknobs and Broomsticks as Mary Poppins meets Harry Potter meets Nemo meets Narnia who via the Lion King who will remind you of Tigger because tiggers really are wonderful things. Although this movie seems to borrow from all the aforementioned, it was actually made in 1971 and has since become a Disney classic acceptable for all ages. It is Directed by Robert Stevenson and stars Angela Lansbury, David Tomlinson, and Roddy McDowall who plays a catholic priest. The interaction between Lansbury and Roddy is fascinating in that subtly explores the complex relationship between religious and humanistic philosophies. This wonderful musical will keep your children engaged especially the creative special effects and scenes featuring the animals from the Island of Naboo. I really enjoyed how the ghost army, no doubt borrowed from Tolkien's lord of the rings, overcomes the Nazis without shedding one single drop of blood. The movie begins innocently enough with a woman played by Lansbury who is secretly studying for her correspondence degree in magic. However, her plans are complicated when by royal edict she is forced to house three children who have been left homeless by the war. When her final magic lesson is suddenly canceled, Lansbury-with children in tow- sets out on a journey with the aid of a magical bed to solve the riddle plaguing her life and keeping her from accomplishing her self-assigned top secret mission. The movie is responsible for bring notoriety to the phrase TREGUNA MEKOIDES TRECORUM SATIS DEE making it since one of the most famous spells in the world. Parents can rest assured that Disney was careful not to include real magical spells in the movie especially those kinds that raise the dead. The gibberish spells used in the film are harmless and Parents need not worry about the children using them to transform people into bunny rabbits or conjure grandpa up from the local cemetery. However, to take the mystery out this whole ordeal, I have prepared a translation. "QUORUM" :In the neutral-plural-genitive, the word QUORUM neatly translates into the phrase "the army, half OF WHICH there were not a few" meaning a significant force. SATIS translates "enough," " sufficient / sufficiently." DEE is somewhat problematic. In Latin DE is a preposition meaning "down from," "from," "concerning," "about." As a preposition, it connects a noun to another element in a sentence. However, DE may also be understood as an ablative-the Latin case of adverbial relation, which implies the notion "away from," the source or place of an action. Now if we combine these meanings creatively we have a gibberish spell that makes sense for the movie. TREGUNA: "Three armies arise! You go!" MEKOIDES: "And be at rest for you will do fine with ME for that old black magic has ME it is spell. And once again you will see! Yes you will be seeing with mortal eyes once more." TRECORUM: "Oh Three great armies, half of which where no so few" SATIS: " yet sufficient enough, I summon you". DE: "concerning war." The phrase is innocent enough and without the magic of adventure, our lives would be boring dull propositions and our imaginations null of the creative forces that gave us the legends we still embrace to this day. However, a warning to cat-lovers. This movie adds a huge exclamation point to the stereotypical black cat. I have never in my life seen a mangier domesticated cat than I did in this film. I asked my cat Fanny, what she thought, she said, "Cats are clean animals ...even magical black cats." This movie is one of those family charmers that has something for everyone. There is an exciting animated portion for the children. There is a love story for the ladies. And there is a battle with World War II Germans for guys of all ages. Tying all these different aspects together is a wonderful concept; Angela Lansbury is a mail-order witch! During World War II, parents sent their children from London to the country because London was being bombed continuously. Three children, Carrie, Paul and Charlie Rawlins (performed by Cindy O'Callaghan, Roy Snart and Ian Weighill, respectively), are placed with Eglantine Price (Lansbury). We quickly learn that Miss Price is completely uninterested in caring for any children as they may upset her mysterious plans. The children, and we, soon learn that Miss Price is a witch in training, training received by mail! Because Miss Price is actually a very nice, if somewhat eccentric, lady, she works a compromise with the children, allowing them to live with her in her large home. We also quickly learn that the mail order school is closing, and Miss Price was looking for an important lesson. The children and Miss Price are off to find the headmaster of the school, Mr. Emelius Browne (played by David Tomlinson, who also performed in "Tom Jones," "Mary Poppins," and "The Love Bug"). Their mode of travel is a bed that Miss Price has modified using a spell. Mr. Browne is astounded that his spells actually worked. However, Mr. Browne is also sorry but he is unable to provide the important spell that Miss Price is seeking; a spell that could save England from Hitler! Soon the children, Miss Price and a disbelieving Mr. Browne are off to Portobello Road to find the book containing the spell, instead running into the Bookman (played by Sam Jaffe, who was Gunga Din in the 1939 movie "Gunga Din," and was in other great movies such as "Ben-Hur" and "The Day the Earth Stood Still"). After escaping the Bookman, the children and adults head off to a mystical island and encounter a group of animated talking critters. Returning from the island, the three children and two adults are prepared to rest from searching for the important spell when they discover a German submarine has landed soldiers that are planning to create mischief in the English countryside. The ending of this movie is a charmer that will intrigue even the most jaded of movie fans, and provide laughs for everyone. This movie is pure escapist fantasy that begins with a very real life event, much like other similar stories such as "Alice in Wonderland." I think Angela Lansbury makes this movie believable. She slips into her role very comfortably, making you believe that she is a somewhat bumbling witch who barely controls her own spells. She is admittedly a novice at being a witch, but a very believable novice. This movie centers on her and her acting ability. Once you accept Miss Price is an apprentice witch, a traveling bed, which is accompanied by dated special effects), animated talking animals, and armor moving by itself are easy to accept. Even easier to accept are the laughs that go along with the story. This movie is from the era when Disney Studios had a fool-proof formula for delivering good family movies. This family movie is one of the best, and will be a treasure in every family's movie library.